In his brilliant new book The Wright Brothers, historian David McCullough reminds us that in 1903, when the two bicycle mechanics from Dayton, Ohio proved to the world that powered flight was possible, America was not entirely onboard with the idea that machines could fly. Wilbur Wright made his first public flights in front of crowds in France, not the United States. It would take more time and flights before interest in the aeroplane took off here as it had abroad. When it did, the awed first spectators rushed onto the landing fields, not understanding that the open swathes were for the planes to land, not places for the audience to assemble. They thought the pilot would simply alight, balloon-like, in his craft. In May 1912 the heretofore quiet farming community of Hampton got its first look at a ‘noisy reaper in the sky’ when pioneer aviator Harry Atwood of Massachusetts buzzed the town in a Burgess-Wright biplane on his way to Portland, Maine. On the return trip he landed on the Hampton River after becoming lost in a fog bank. The field of aviation advanced at warp speed, in part because it offered the public an exciting new amusement. Showmen immediately saw the potential of aerial exhibitions, the more daring the better, as they drew the largest crowds. 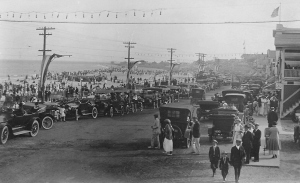 At Hampton Beach in 1915 an aerial act billed as ‘the most thrilling ever seen in New England’ made daily appearances at the new, end-of-summer Carnival Week. Two Massachusetts aviators, J. Chauncey Redding, who held the first aviation license issued by the Commonwealth, and J. Howard Bushway, heir to a Somerville ice cream company, demonstrated the art of ‘aerial warfare…in which a defended fort is bombarded and destroyed by intrepid aviators high in the air out of reach of the fort’s guns.’ Parachutist Phil Bullman demonstrated the tricky art of jumping out of a perfectly good airplane. When Blanche Thompson was crowned Queen of the Carnival, Redding took her aloft for the thrill of a lifetime. Later in life she would recall to local reporters the excitement of flying up to 1,000 feet and then landing on the sands of Hampton Beach with a flat tire. 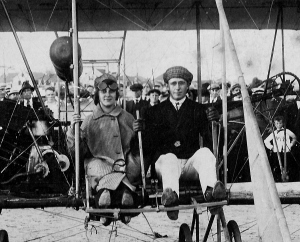 The aviators were an immediate and memorable hit, and had Redding and Bullman survived when their plane crashed into a Saugus, Massachusetts marsh a month later, they likely would have been back for the 1916 Carnival Week. Bushway instead procured the 19-year-old ‘Boy Aviator,’ whose daring aerial exploits, not the least of which was being shot at and wounded while flying a scouting mission for Pancho Villa in the Mexican Revolution, were all the current rage. ‘Nine months actual experience with Villa’s army in Mexico!’ hawked the exhibition advertisements. This early war pilot and barnstormer was Farnum Thayer Fish of Los Angeles, the world’s youngest licensed aviator. At age fifteen he earned his pilot’s certificate after completing four hours of flight instruction with Orville Wright at the Wrights’ flying school in Dayton. 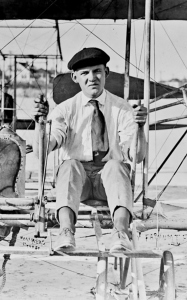 Farnum quoted Orville as saying, “if you couldn’t learn to fly in four hours, you shouldn’t be flying anyway.” This suited Farnum’s need for speed, and he immediately bought a Wright Model B biplane, shipped it home, and entered what the Wright brothers had called the ‘mountebank business’—exhibition flying. 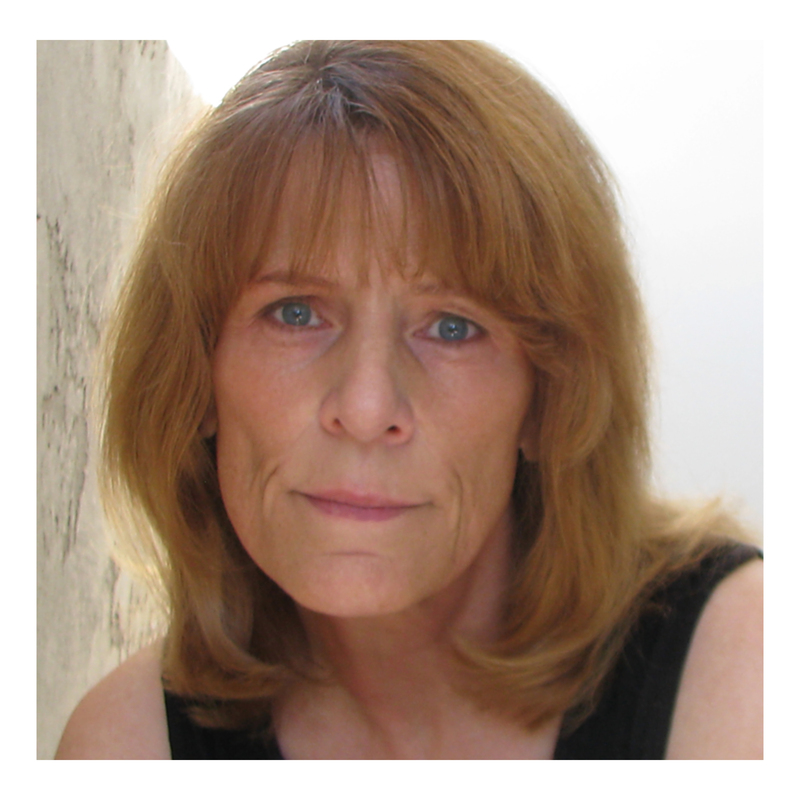 Although born and raised in California, Farnum’s namesakes were New Englanders. The first Farnum Fish was born in 1775 in Uxbridge, Massachusetts and settled in Swanzey, New Hampshire, where he married Rachel Thayer, a physician’s daughter. Their third son was the Boy Aviator’s grandfather, Ezra Thayer Fish, who went on to make his fortune in Pennsylvania coal. Ezra’s son Charles, a physician, left the weathery East in favor of sunny southern California, where he married Catherine Goodfellow and raised two boys, Winthrop and Farnum. Farnum’s most interesting relation was his maternal uncle Dr. George Emory Goodfellow, a gutsy, perpetual motion machine, an expert on gunshot wounds and a pioneer in the use of sterile techniques. He kept an office above the Crystal Palace Saloon in Tombstone, Arizona, so that he could gamble and drink when he wasn’t pulling bullets out of cowboys and lawmen like Virgil and Morgan Earp of O.K. Corral fame. Among his many other exploits, he hunted and then befriended the Apache warrior Goyahkla (Geronimo), got himself bitten by a Gila monster to see if its venom was as poisonous as was commonly believed (it wasn’t, but it still kicked like a mule), and survived the disastrous 1906 San Francisco earthquake. This early headline exemplified the adventurous, restless spirit of the times that had Doc Goodfellow’s nephew firmly in its thrall. Before discovering the thrill of piloting his own ‘rattle trap,’ Farnum channeled the zeitgeist into petty law-breaking. As an aviator he was at times suspended and blacklisted for not following the rules. He enjoyed performing dare-devilish, dangerous feats like the Death Dip and Texas Tommy Twist for his earthbound spectators. He also liked to ‘mushroom hunt’ (fly low) over the tops of their heads, which got him into trouble with aviation officials on more than one occasion. A combination of skilled aerial showman and a cat with nine lives, Farnum survived some pretty hairy crashes, into a pond in Wisconsin and into the ocean at Revere Beach. In June 1916 he performed flawlessly over the Charles River Basin, but at Lynn the following month, as he was attempting his signature bomb-dropping stunt, several of the homemade devices detonated in the plane’s ‘bomb box’ beneath the passenger seat. Farnum was able to land the plane safely, but his assistant received burns when his shoes and clothes caught fire. At the Nashua fairgrounds a few weeks later he attempted to take off from the infield of the track as a motorcycle race was in progress. The airplane snagged on the fence at the far end of the field and crashed onto the track as ‘nine motorcyclists were tearing around it.’ Farnum received burns to his face and wrist and his parachutist Joe Schiber suffered several sprains, but they skirted any serious damage. Like Chauncey Redding the year before, Farnum took the Carnival Queen for a ride in the sky. This year’s winner was Clara Dudley of Hampton, who had won the title by selling the most chances to win a new Ford automobile on display in the Casino bowling alley. With her long skirts safely roped down, Farnum’s passenger enjoyed a ‘long trip to the southerly part of the beach,’ and returned to circle the Casino before landing. 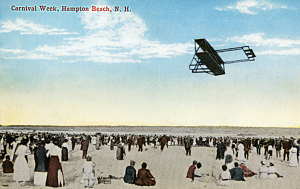 It may have been a wishful guesstimate, but it was reported that a single day’s attendance ‘easily’ totaled 100,000—all on hand to cheer Farnum’s aerial maneuvers over Hampton Beach. If the numbers are true, his Carnival Week appearance was the high water mark in his career as a stunt aviator. He had exhibited in front of huge crowds before, but this may have been his largest ever. Almost overnight, Farnum’s days as a daredevil birdman came to an end. His high altitude antics no longer filled newspaper columns across the country. It was reported that he eloped in January 1917 with his childhood sweetheart, was ‘doing work for the government,’ and in 1918 went overseas as a test pilot for the Army Signal Corps. Barnstorming lost its novelty and died out after World War I. No longer the ‘Boy’ aviator, Fish decided that he could, as he said, “make more money on the ground.” He left flying and the public eye for good, but temporarily surfaced in the early 1970s for an interview with a San Francisco area newspaper. He died in Napa on July 30, 1978, never having told the full story of his life as an early aviator. Aviation humor in 1911: A Wright machine flew over a mining town. Was it Orville? A HISTORY MATTERS column published in the Hampton Union, June 2, 2015.